SYNOPSIS- A Platoon of Allied army (Refer World War II) lands amidst a shore invasion in the Italian Peninsula. As they loose men and confidence, the remaining platoon searches to prove their worth in battle. EXCERPT- “Cold,” Private Judson said. “It can’t be cold. Its sunny Italy,” said Riviera. “You read the wrong handbook”. “I read the soldiers handbook” said Riviera….. They all felt better somehow. ….. It no longer mattered that they weren’t exactly sure where they were going or what they would find there. KOUSTABH 'QUETZALCOATL' says- Yeah okay it’s a military book, starts with the description of a guy who is the lieutenant of a fictional platoon and is heading the platoon in a battle torn Italian peninsula. Guns fired, bombs drop. WOAH!! The leader (who seemed like the protagonist) is dead!! Okay the team lands and a new leader arises, very practical and respecting the order of Army. Some pages later, he is reported DEAD!! And from the remaining places rises up the protagonists (yes this is a story that give equal thought and page space to many) and the story continues literally a walk in the sun. What is most amazing here is the realism in the novella. War is not always about bombs, guns and heroes who don’t die even after a whole barge of bullets are thrown at them. Here Harry Brown show even veterans give in to battle fatigue (or Shell Shock if you will), and people dying because a single bullet mistakenly found its mark. The enemy is non existent (until the last part of the novella), and injury is shown to be a vital but unavoidable part. From descriptions of helmets, to instant strategy (almost like insta-coffee) and real bang-bang in the last parts, this novella has it all, yet in ultra realistic way. The name ‘A Walk in the Sun’ itself sets up the tone. Everything happens in a single day and war is represented as a long and tiring walk, which it really is for most people until they face the bullets head on. Some walk on, while others stay back and not all of them are dead. Some are crippled and hope a purple star for bravery, others, well, just looses it!! So where does this ultra realistic novella having both sides of the war coin lack. It is in its pace. Realism is good, overt realism stretching through pages can be a tiring activity. Though it is seemingly interesting enough, yet I couldn’t read it in one go (maybe I am just lazy). But thinking back, maybe the stretching out makes you appreciate the witty parts and the final battle even more (I won’t say no more about the surprises). 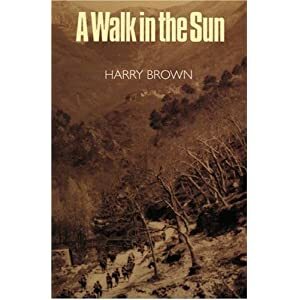 In the backdrop of bombs and shelling, Harry Brown brings forth some flesh and blood men in army uniforms. A new read (though it’s an old book) for those who want to see a new part of war and realistic literature. P.S. - I’m so sorry for being out of touch for so long. Exams and other things have kept me apart. But I am back!! So Keep Reading guys and gals out there!! Love war novels (and novellas) I'll keep an eye out for this one. Great review!